Weekend DIY warriors and contractors use the best power tools for their work, and among them is the best angle grinder. You can do a lot of different things with angle grinders like polishing, cutting, and grinding. Since you are doing your research about these tools, you already know that they are the most common tools in any workshop. You can see people using it in construction sites, metalworking shops, auto shops, almost every job that requires you to remove the excess material from things. Even if you are a do it yourself guy, you probably would like to have this tool for the projects you are doing at your house. Why is there a need for Angle Grinders? When you see some of the best grinders, you might think that they are too sophisticated to use, but after using them, you will be proven wrong because you will see how useful they can be. Is your blade dull? Well, you can use an angle grinder to sharpen it. Chopping & cutting tools like mower blades, axes, and shears can easily be sharpened when you have an angle grinder. Do you have to remove some old mortar but you don’t want to waste much of your time by using a hammer and chisel? Well, then you require an angle grinder because it can do the job much faster. It gets even better if you have the diamond tuckpointing wheel special attachment. With an angle grinder, you can even extend the life expectancy of your garden tools. You know how hard it is to remove the caked-on cement and rust from a shovel. But with an angle grinder that has a wire wheel attachment, this job will be a piece of cake. If you want to do Re-tiling of the floor, then use a grinder that has a dry-cut diamond that allows you to cut stone and ceramic tiles easily. There are three main angle grinder types. Compressed or pneumatic air powered, Gas-powered ones, and electric ones. The most common type you can find almost everywhere is the one powered by electricity. It uses power from a battery, wall outlets or even from a transformer which is often used on building sites. It is perfect for medium to light duty applications. Do you like doing things yourself? If that is the case, then this type is the best one for you. A better choice for a construction site is a gas-powered grinder. Gas powered angle grinders are powerful and large; therefore they can cut blocks, bricks, and steel. They are complicated to use and also expensive. As for the pneumatic angle grinders, you can mostly find them in auto workshops. 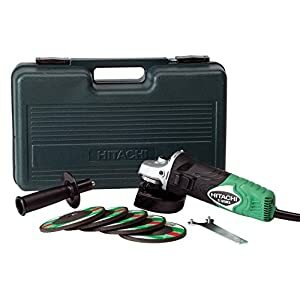 It has a compressor that is responsible for the power of the tool. Just like the gas ones, this type is also expensive, and it is best for professionals. Now that we have given you some basic information about what an angle grinder is and some of its application. Now let’s get to the main part of the article. Here you can find a list that we have made about the best angle grinders you can find out there on the open market. If you are looking for a grinder that can cut and remove materials efficiently, then this is the one for you. The speed of this grinder is 11,000 rpm thanks to the fact that it has an 11 amp motor. It is simple to use because it has a one-touch guard. You can also rotate the guard for 360 degrees. If you want to change its position, you have to bump it on the table, and you will get it placed how you want. When removing the wheel, you won’t need a wrench because it has a quick-change release. 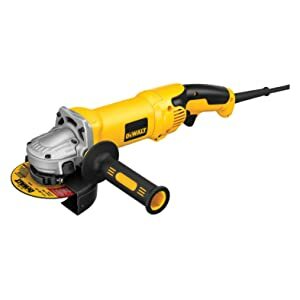 It is an angle grinder that lasts long according to the customers, and this is mostly because it has a fantastic ejection system for dust. Another remark made by the customers is that you can use it for a longer time because it is comfortable for your hand. It only weighs around 7.7 pounds. The maximum wattage is 1400 W. The cord is maybe a little shorter than the other ones we reviewed, but it is not that short. It is six feet. For a better cut depth, this grinder has a mounted spindle lock. It also has excellent over-heating protection which means you can use it for a longer time without stopping. The warranty on this one lasts three years. 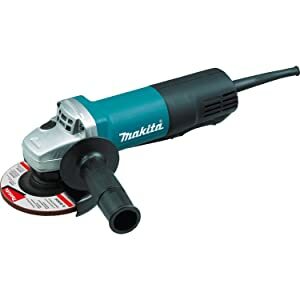 The Makita is also a great angle grinder. Like the previous, this one is also small, and it has a 7.5 amp high powered motor. It is also light, weighing only around 4.5 pounds which means that you can use it for a longer time. The motor is protected with a labyrinth construction which seals it so the debris and dust can’t get inside. For more comfortable use, this grinder has a large paddle switch. For even better comfort, It has a small diameter barrel grip. With it, you also get a sanding disc and a wire cup brush. For better energy conservation this grinder has wires coils that are thicker and more carefully put together. It is durable, and the housing made out of metal with a unique all-ball bearing design. The cord length is eight feet which are quite satisfying. The maximum speed of this grinder is 10.000 rpm. This grinder has an AC/DC switch. With the grinder, you also get a side handle, wheel guard, inner flange, lock nut, and a grinding wheel. The warranty for this grinder lasts for a whole year. 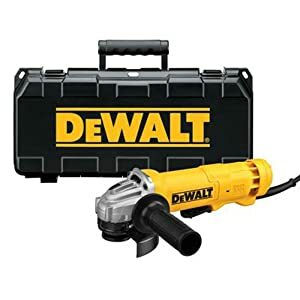 The DeWalt DWE4214 Angle Grinder is one of the best angle grinders you can find out there. It is an excellent tool for some smaller projects because it is small itself, but it is still versatile. It is excellent for sharpening blades or cutting tiles. It is a powerful grinder, but it also gets excellent reviews because with it you get a warranty that lasts three years. It only weighs 4,6 pounds, and it has a size of 9.1” x 6.6” x 19.9”. It also has an excellent ejection system for dust. The maximum speed of this grinder is 11,000 rpm which means it is pretty fast. The motor has 1.8 horsepower, and it is 11 amp. The voltage of this grinder is 120V. The power cord has a great length with 6 feet. If you are a little clumsy, then you will be satisfied to know that this grinder has a paddle switch lock-off for protection. The handle is removable. If you have a lot of things to do, then you will be glad to know that it has a quick changing capability. According to the customers, this grinder feels powerful and reliable. Another great thing about it is the fact that it is comfortable for the hand. It is user-friendly because it has a handle that you can move to either right or left side depending on the material you are cutting. You also get a durable case with this grinder. The motor can produce 400 watts of power, and it has an amazing six amps. This grinder also has a spindle thread that is 5/8” x 11”. The size of this grinder is 10” x 2.5” x 2.5”. The motor durability is enhanced with the usage of an auto-stop carbon brush. For a better grip, they built a small grip. If you need to use the grinder for a long time without stopping, then you will be glad to hear that it has a trigger lock-on made for more comfortable use. The cord is eight feet long. This grinder also has a one-touch off/on the switch. With the grinder, you also get five wheels. The warranty lasts one year. 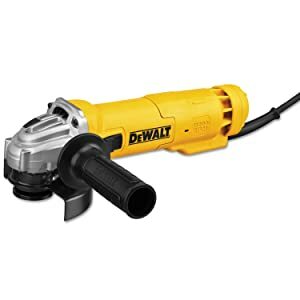 This grinder is amazingly powerful, and it has a 2.3 horsepower, 13 amp motor. Despite it having a small frame, this angle grinder has the power that you can see in some 9-inch grinders. It is not a complicated grinder to use. You have to pull a small trigger, and the fun begins. With this one, you don’t have to release the safety every time you turn it on. It is famous among both pros and DIYers because it is small and therefore your hand won’t get tired from using it. The maximum speed of this grinder is 9.000 rpm. The motor has extra protection because it has dual abrasion protection. This grinder has 1700 watts. The size of the spindle thread on this grinder is 11”-5/8”. The length of this tool is 15.25 inches. It weighs only 4.75 pounds which is amazing considering how powerful it is. With the angle grinder, you also get a side handle with a 2-position and a guard wrench that is keyless and also adjustable. This is a great representative of this company. It features a brushless motor and a cordless setup which gives it the edge over other angle grinders. It has immense power and is capable of doing harder jobs like the ones in an auto shop or a service garage. It can easily cut through concrete, stone, and tile. It doesn’t overheat easily because it has a special electronic system that prevents it and keeps the batteries safe. Because of this, this angle grinder is durable and can last a long time. It weighs around 5.8 pounds. 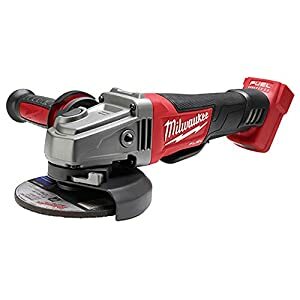 Unlike other 4.5 inch grinders, the Milwaukee can also use a 5-inch wheel. The speed of this grinder can go up to 8,500 rpm. Above products are the best angle grinders by our consideration, but if you are still puzzled to buy which one then we have made few more pointers on what to look for when you are buying angle grinders so that you could refine your search and find the best angle grinder for your needs. Looking at the discs of a grinder, you can easily tell if it has a high power motor or not. You can find discs in various sizes with the 4.5” and 9” being the most used ones. If you want a grinder with a small disc, then the best ones for you is the pneumatic angle grinder. Grinders have various amp ratings, voltage, and wattage. You have a choice between 2500 and 500 watts, and from 15 to 4 amps. If you are buying a grinder for household tasks, then you won’t need one that has a powerful motor unit. A crucial part of an angle grinder is its dust management. Be sure to get the one that suits your needs. Make sure that it has high-quality dust management. A vital role here plays a diamond blade. The cost of the angle grinder doesn’t matter; you have to make sure that you get the one that has useful features. Two main things affect the usage comfort of an angle grinder, and those are its weight and use-size. If you need to use it for a longer time without stopping, then the compact unit is for you. Another thing to look for in the grinder is handles that reduce vibrations. But, if you need it for some more significant projects like industrial jobs then the more prominent the unit, the better it will do the job. Grinders can make from 10,000 to 5,000 rpm. Only professionals are advised to use high-speed grinders, as higher the speed, higher the risk of losing a finger. Lots of grinders have features that are there to make it safer for use. These are the easy-to-position wheel guard and a tool-less guard. We know that it can be hard to find the right angle grinder for your needs. But don’t give up and don’t settle for the ones that are lower quality because that would be a waste of money. It is always hard when you are starting something new. We hope that we have helped!